The CopperLink Ethernet Extenders Patton 2158 Local and Patton 2158 remote Patton 2158 2 pack will auto-sense and configure for 10Base-T or 100Base-T as well as full or half-duplex Ethernet operation. Take your network connections faster and farther over existing voice-grade wire with the Patton Model 2158 CopperLink Ethernet Extender! 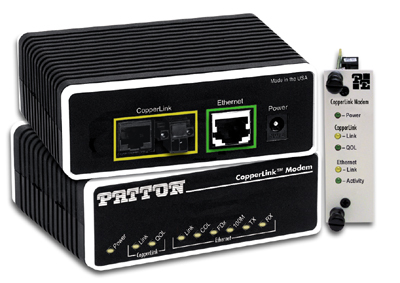 The Patton CopperLink Ethernet Extender offers one of the most efficient, reliable, and cost-effective solutions for connecting peered 10/100Base-T Ethernet LANs; reaching remote PCs and equipment; or delivering last-mile ISP services—all at 12.5 Mbps! The Patton Model 2158 offers premium performance over your existing voice-grade telephone wire, eliminating the cost of installing new LAN grade cable or expensive fiber. CopperLink Ethernet Extenders are compact, easy to install, and transparent to higher layer protocols. Simply connect the network equipment to the shielded Ethernet RJ-45F jack, the twisted-pair telephone wire to the CopperLink RJ-45F jack or terminal block, the external power supplies to the units and an appropriate power source, and you're ready to operate. The CopperLink Ethernet Extenders will auto-sense and configure for 10Base-T or 100Base-T as well as full or half-duplex Ethernet operation. No configuration is required! Whether you are looking to make your network connections go farther and faster, increase the efficiency of your existing wiring infrastructure, or just simply extending your LAN, Patton's CopperLink Ethernet Extender is one of the most simple and cost effective solutions around! Used in pairs, the Patton 2158 establishes a high-speed 12.5 Mbps communication link inter-connecting two geographically separated LANs. Operation is simple: packets destined for the remote LAN are sent transparently, at full line rate, to the peered LAN. The Patton Model 2158 can also be used to reach remote PCs and other equipment and for delivering last mile ISP services. Use the Patton Model 2158 units in a back-to-back configuration, using an Ethernet crossover cable, to double the length of your high-speed Ethernet connection! Note: When ordering standalone units, we recommend that you order the 2158 in sets since one 2158/L (Local) and one 2158/R (Remote) is required for each link. The Model 2158RC rack cards are compatible with Patton's Model 1001R high-density Telco rack system. Front Panel Indicators: Power, CopperLink Link and Error, Ethernet Link and Activity status.